This insert is designed to be compatible with Scythe, and the Invaders from Afar expansion.The design provides both efficient storage and improved game play. Many of the trays can be utilised during the game, and they greatly aid set-up and clear-away times. The rules act as a lid on top of the trays. 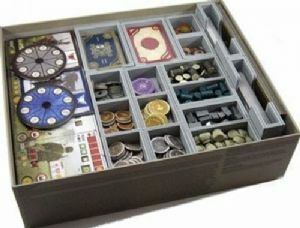 There is sufficient storage space for the realistic resource tokens, the metal coins, and also for seven combat dials should you have them.